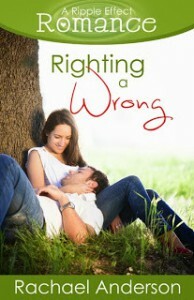 Righting a Wrong tells us Jace and Cambri’s story. We have already met Jace in Silver Linings. When we start with Righting a Wrong, we already know Jace at a basic level. Jace moves on after his best friend and now ex-fiancé falls in love. He makes a complete new start as he moves into a new house and a new life – or that was his plan. But fate had something else for him in mind and situation becomes such that the only house that is available for Jace’s consideration is the house that Cambri, his first love, loved. But that’s not all… Cambri herself moves into town temporarily to take care of her father. Cambri had no intention of looking up Jace but not bumping into him in their small town would call for a miracle. Once put face to face together after years, their chemistry sparks emotions right back into a place that they didn’t dare dream of. Will they be able to put their past together under wraps or will their past together only make them come together again in the present. Ripple Effects Novella Series have a specialty of telling stories in a limited number of words, yet leave you feeling like as if you have known the characters forever. As we follow Jace and Cambri, we become a part of their lives, we can’t help but fall in love with both of them. Sweet and loveable characters, fun situations and an effective narration style makes time fly by and the book over in what seems to be minutes. I liked Cambri’s father in an odd sort of way. But, Jace’s grandpa takes the cup for the best character in this book. He is so much fun that even with almost a cameo role he made a great impression on me. Appearance of Lydia (whose story, Lost & Found is up next in the series) was almost expected with the way all these stories are interconnected in a way. I also liked the way that Jace and Cambri remained in the spotlight, yet the author managed to portray and develop Cambri’s relationship with her father. All in all this is a sweet love story about misunderstandings, forgiveness and the essence of first love.